This is a post about Romanticism and technology, about the way the technologies of representation shape the ways we see, about models and love and fear. But I wanted to try to think through the implications of another piece of programming on how we actually think. 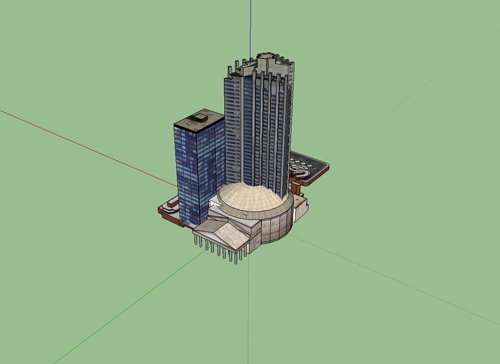 This year at the AA we’ve been using freeware SketchUp models. This has caused much snooty tutting from the massed Grasshopper and Maya ranks that make up majority of the school. And it’s easy to see why. These are on the whole amateur products made for who-knows-what-reason. Maybe it’s the same reason people build fantastically detailed railway models in their attics or models of Blenheim Palace out of hundreds and thousands of matchsticks. Maybe in these oddball projects there is a physchology at work where the act of modelling the world is a way of somehow understanding or controlling those things which are far beyond our control: The things which screw us over, screw us up; The things that are too big for us to contemplate. Modelling in this way performs a kind of therapy. There’s a calmness in the model. Its scale, its distance and position in relation to us, its frozen and timeless sensation – the functions of its ‘unreality’ – are a place outside of the anxious fuzz that so often swallows us. 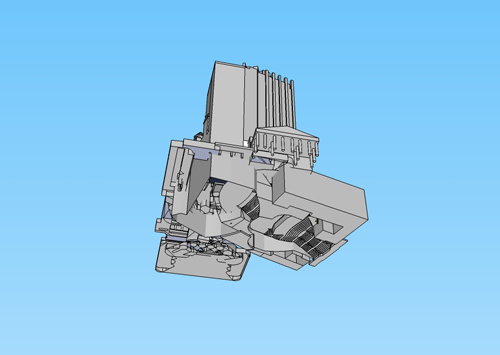 So, the SketchUp model. This has none of the charms of, say, a model village, or the amazement of a matchstick model. It’s an ugly format, an ugly medium. Basic, dumb, utterly devoid of expression. Isn’t it possible – actually, isn’t it important – to understand this medium? To interrogate what it includes and excludes from its representational repertoire? (after all this issue of inclusion and exclusion is how we figure the invisible ideology of the technology, just as Zadie Smith explains that Facebook is the representation of the idea of friendship as conceived by a Harvard nerd. The possibilities of expression are limited by the language of expression, like the difference between Shakespearean ‘love’ and Hallmark-ian ‘love’). 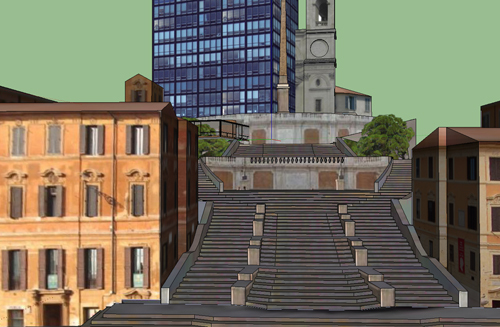 And when we start to look closely, isn’t there some kind of strange sublime operating in the SketchUp landscape? Even when there’s nothing there, there’s the green flat land and the simple graduated fill sky. A landscape whose utter, terrifying banality we ignore so easily in our eagerness to get on with whatever task we have at hand. What if we just looked into this landscape. What would we see? What would we learn? This after all, is a model of the world. Maybe it’s the truest way of seeing the world as conceived by Google? Or perhaps it’s the real view of landscape after the Internet, or the surface of the planet as viewed by the military-industrial complex? Maybe this is something we could call SketchUp sublime: A landscape of horror and beauty that might take the place of the now-commercialised wildernesses where sensations of the sublime originated. And what if we were to reconfigure this landscape as a conceptual terrain. One in which we might place things into that don’t belong there. Or perhaps we should use its tropes as a way of exploring unlikely subject matters. These images – not that they are much to write home about – are a quick experiment in just that. A kind of public auto-therapy that’s an attempt to shake something. An attempt to inhale SketchUps dead calm, and attempt to throw the image of moments and places into something that might be a possibility. Jeff – Those are completely frightening. Definitely verging on the insane, like some strange form of digital outsider art. Google 3D Warehouse was the mainstay of my diploma project. Glad to see you are introducing this to the AA! Introducing Sketchup at the AA must be like going door to door on a Saturday handing out ham sandwiches in Golder’s Green. SketchUp is a tool like any other; if its users see nothing but banality in its blue and green nowhere and its humble-pie interface, that is perhaps their problem. It has a well-integrated Ruby (!!) interpreter, a relatively straightforward API, thousands of available plugins, and is well connected to the Google Machine. 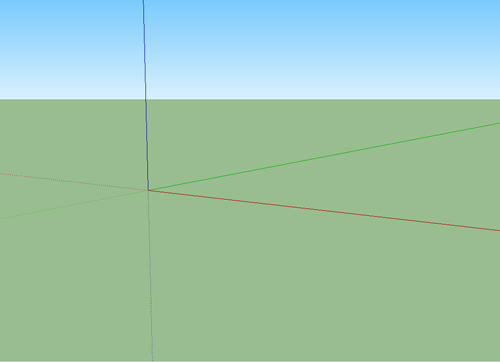 No NURBS, and no ability to deal with really high complexity, but for God’s sake, even the blue and green nowhere (and Sang, standing there, contemplating it) are the *default* template. Critiquing the body of an automobile is shallow. Have a look at how it handles first, at what kind of speed it is capable of, how it drives after 3,000 miles. Then write your report. Perhaps the terror of SketchUp is the terror of realization: the avant-garde is overly preoccupied with looking sleek, edgy, and esoteric. Please continue with this experiment. I’d like to see what conclusions, if any, you arrive at. Hi. Before you start writing software such as SketchUp as simply ‘banal’, perhaps you might like to look at the work of Paul Russam, who recently reproduced an number of Northern Ireland church visualisations, and published the results in SketchUcation, a forum dedicated to SketchUp users worldwide. As for rendering within SketchUp, because lets face it, the majority of this “banality” you talk about, are based on non-rendered images. (you may have to register in order to view the rest of the work, if images are uploaded to the server). Glad to see you’re using SketchUp and 3D Warehouse at the AA, and I think you’ll find some interesting and surprising results if you keep at it. Never mind the tutting… they wouldn’t be doing that if you weren’t onto something interesting. We designed SketchUp to democratize the world of 3D modeling and to make it accessible to the broadest possible range of “designers.” It is by definition an anti-elitist design tool. It is cheap (even free) where other tools are abusively expensive. It is quick to learn where other tools require enormous commitments of time. It naturally produces unpolished representations that invite discussion among stakeholders on a team rather than slick renderings that hold clients at arm’s length. It invites “expertise” no more or less than any other tool, but doesn’t require it. SketchUp is designed to be as powerful as a pencil and a roll of tracing paper. And as weak. I think the models you see in 3D Warehouse are evidence that our attempt at democratization is working. An astonishingly broad range of work is visible there- from the loftiest of mathematical theories to the humblest of amateur skateparks. SketchUp is used regularly by over a million unique users a week now. Most of whom, as is true of the general population of people in the world, aren’t architectural theoreticians. I do think you’re wrong if you assume that the populist positioning for our product comes from a position of naiveté, tempting though that may be. Many of us on actually came from very theoretical backgrounds in architecture. I was a student of John Hejduk’s at Cooper Union (the AA across the pond) in the early ’90s and I well understand the issues you are raising. Given the choice, we just chose a populist path for our product over something more exotic. I hope your research goes well. Or at least that it leads you in an interesting direction. I welcome further discussion on this subject if that’s useful to you– my email address is appended below. And I’ll keep an eye on your blog, too. Thank you John Bacus for that. To author: What do you think about pencil? There is a BIG difference between my 5 years old boy drawings and drawings of Edgar Degas, but yet, with the same tool. Thank God it was not overpriced. SketchUp is a pencil for drawing in 3D space. Just to clarify, the post wasn’t a criticism of SketchUp in any way! In fact, it’s a fantastic tool – and I appreciate Johns comments about anti-elitism. In fact, this relates to the point I was trying to make about all tools – that they somehow represent or embody a idea beyond what they actually do. Here cheapness, availability, and simplicity of use seem a way of offering un-professionalised access to 3D design and promoting a popular interest in architecture. Of course, super complex projects can be designed and then rendered beautifully out of SketchUp – which is something we’ve been doing at the AA over the last couple of years. I think there is something beguiling in its simplicity. Something that we should look at with more care. 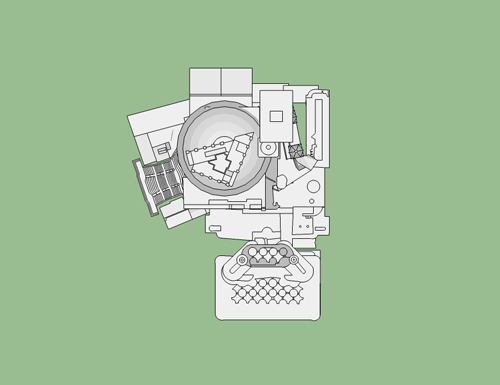 Of course, 3D Warehouse is also amazing. It’s quite incredible to think about this resource (and all of the people contributing to it – amateur, student or professional) are creating something of tremendous value. Again, something that we have yet to fully realise the potential of. I guess the question I was asking was something like: What would John Hejduk do with SketchUp? How can we use it as a rhetorical or poetic tool? How can we learn from its own representational and spatial language? Love that Max Grueter work! 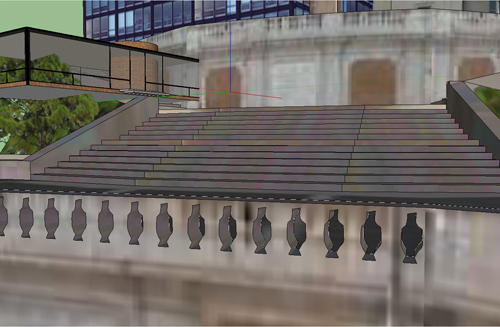 Some may see SketchUp as simple and it is to a point, but to think that was the extent of it would be a mistake. first and foremost in the equation is the opensource approach of incorporating Ruby… this means anyone, any where can customize the software to their exact needs and then others can build on that knowledge base… instead of the stagnant Autodesk approach of vigorously protecting their bottom line via outrageous licence fees and a red tape nightmare of licensing for trademark use. when is the last time you saw a free 3D Max plugin? what’s more; how many years have autocad users yearned for a pencil or line tool that could draw a 3d line on the fly? well, I’ll just keep blathering if you let me, so I’ll stop with that… once again I enjoyed the post and look forward to reading more. Hi Sam, I like very much the idea that software has certain effects that are specific to the medium and the discipline. What’s weird and cool about it is the way these tools as media change so quickly. A pencil is still a pencil, but what happens to the aura of banality and sublimity when sketchup changes its default rendering template? Or upgrades the resolution of its surfaces? All this is inevitable, and it makes media specific effects in software into a moving target, a kind of hyperaccelerated default that changes as soon as its recognized and employed knowingly. I’m thinking here, for example, nostalgically about Autocad 2005, in my opinion the high water mark of the franchise, now almost wiped out by the upgrade cycles.